No switches to deal with”just step on it and go! In this rig rundown, Michael Angelo Batio talks about his pedals, and he mentions his Morley Wah pedal. At 13:33, he says, "I use a Morley Wah, love the Mavericks." According to [this interview (transcribed from the February 1998 issue of *Guitar Player* magazine)](http://www.oocities.org/sunsetstrip/backstage/1076/article2f.html), Kevin utilized a Morley Switchless Wah during the recording of Third Eye Blind's self-titled debut album. 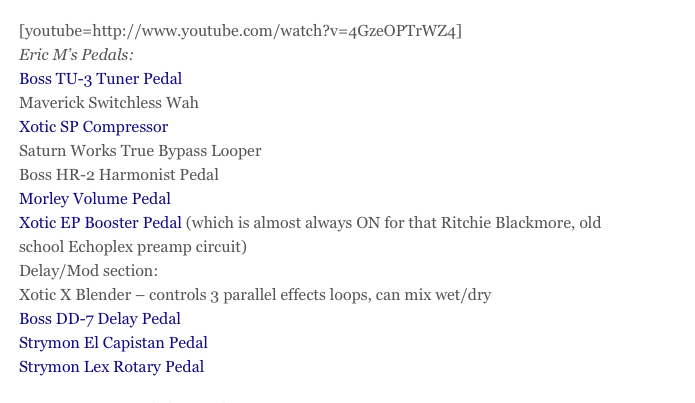 According to [Mass Resonator](http://massresonator.com/tag/strymon-pedals/), Eric Mardis uses a Morley Maverick Mini Switchless Wah. The Maverick Mini Switchless Wah pedal from Morley has no switch for on/off, meaning you just step on it to engage the wah and step off to go to bypass. Electro-optical wah control also means there are no pots to get scratchy and wear out, ensuring years of noise-free use. Perfect for crowded pedal boards, the compact MSW delivers a hybrid vintage/modern wah tone. An LED indicates when the pedal is engaged, and it all comes in a road-worthy, cold-rolled steel housing. Great for guitars, bass, or keyboards! No reviews or videos yet for Morley Maverick Mini Switchless Wah. With an Equipboard account you can rate this item, add it to your collection, submit a review to discuss what you like and dislike about it, and associate Morley Maverick Mini Switchless Wah to artists that use it. Create an account!